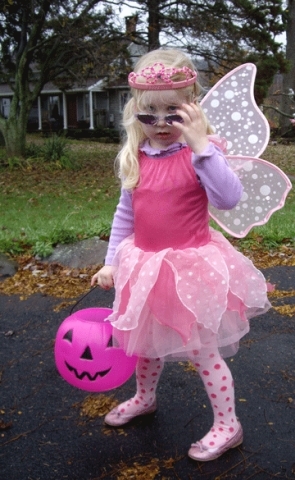 Miss sassy-pants fairy and tigerlily Lil. Lil looked so cute in this picture, I figured that it overshadowed the fact that my eyes were closed and it looks like I have no legs! A fun day was had by all. Candy consumption reached an all time high. I'm feeling the need to make a nice, nourishing soup. I have to get this book from the library, but it's constantly checked out! Must purge all sugar from my body!! I'm sorry about my rant in that last post. It really made me feel better, though, to just make a sort of announcement, to put it out there, that I was feeling creatively challenged and overhwhelmed. Just writing it here suddenly made me feel more positive and I managed to crank out a cute kitty for a b'day present for a special little guy AND to make a Halloween costume for Lil in the same day. So maybe I can work under pressure after all. Deadline pressure, just not pressure from wailing wee ones. That is so funny that they Scarlet and Clara had the same costume. I bought it at the last minute when I couldn’t find a top to go with the periwinkle tutu I already had bought over the summer. They look positively adorable. 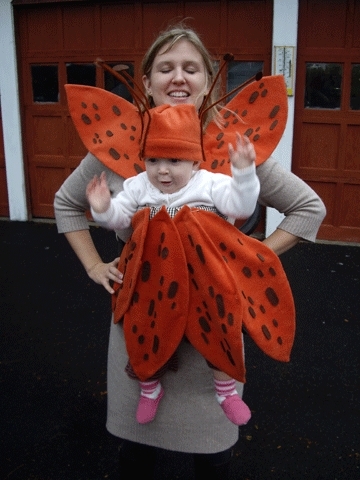 Great job on the tigerlily costume as well. I think your audience loves you so much they will wait for you when you are ready. And my goodness – yay for you for making Lil’s costume – that’s such a good solution for the Bjorn!!! There are clever people out there making some loot on these kinds of things… Well, I sure wouldn’t have thought of it. I love this photo of your tigerlily baby. Awesome costumes.